Product #21163 | SKU 885955 | 0.0 (no ratings yet) Thanks for your rating! 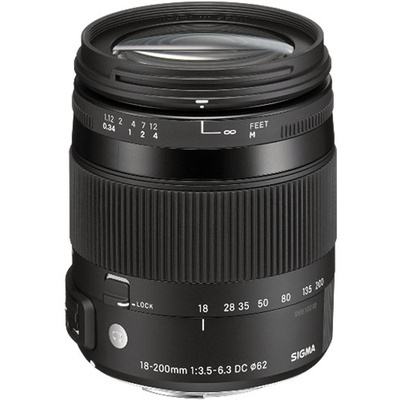 The 18-200mm f/3.5-6.3 DC Macro OS HSM Lens For Nikon Digital Cameras from Sigma is an all-in-one lens covering an 11x zoom from wide-angle to telephoto, with a 35mm equivalent focal length of 27-300mm. An optical stabiliser (OS) system is built into the lens, which reduces the appearance of camera shake. This can be especially helpful when shooting at long focal lengths or up-close macro shots. OS also allows you to use slightly longer shutter speeds, making it possible to shoot hand-held in low-light conditions. The built-in Hyper Sonic Motor delivers quick and quiet autofocus. With a minimum focusing distance of 39 cm and a magnification ratio of 1:3, the lens also acts as a macro lens. The maximum magnification for each focal length is indicated on the lens barrel. The product name on the front of the lens has been engraved, rather than painted, so that when shooting reflective objects up close, the letters will not show up in the image. TSC has the same level of thermal shrinkage as aluminium, with little elasticity, especially in temperature changes. This gives the lens high affinity to metal parts, and results in slimmer mechanical parts.